It takes balls to open your album with an instrumental. 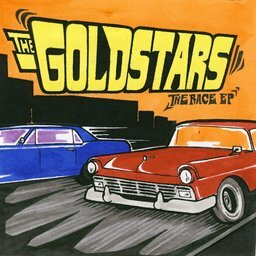 That's what The Goldstars do on their latest release, the 5-track The Race EP. They come out playing hard, fast and loud sounding for all the world like something Quentin Tarantino could drive to box office success. The song rips along like its title, "The Race", complete with a thundering car crash along about the third turn. After that they pick up the pace, and raise the bar for what passes for quality rock and roll these days. The band swaggers through the rest of the EP with a snotty, garagey, ballsy arrogance. From the second track "She's Gonna", an anthemic barn burner kind of piece with cool guitar licks throughout, to "Agile, Mobile & Hostile", and a chance to showcase the farfisa organ styled garage rock that the band does so well, they just shred it up. The album is great followup to my previous favorite release by the band, Purple Girlfriend. If you liked that album, or if you like garage rock in general, you'll dig The Race EP. Purple Girlfriend is my favourite album too. I have "It's all about you" as my mobile ringtone.Je.